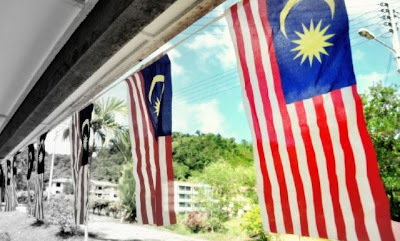 To all Malaysians, happy Independence Day! I look upon this year's Independence Day with great patriotic fervour. I am grateful that every Malaysian citizen still has some say in how the country is to be run & I am glad that Malaysia is currently experiencing the teething struggles of a truly democratic country. I used to be a neutral I-don't-mess-with-you you-don't-mess-with-me jaded indifferent uninterested inhabitant of this country. As long as I can make a living & enjoy life, I don't care who wins the elections. The only politicians I could name were merely Mahathir, Badawi & (recently) Najib. Heck, I wouldn't even bother to register to vote. Neither would I read about current events.. I'd just go straight to the comics or football news! But all that has changed since my nationalistic awakening. I would prefer not to comment much on the current political situation of the country lest I draw unwanted affection from certain parties. But I will say that the political fuss & muss of controversies & allegations occurring this year has held my interest captive. I love a good story with a good twist. All the complexities & ulterior motives in the latest season of the Malaysian political drama has given me a lot of excitement! I cannot wait to see what unfolds in the next episode! Soon, I started paying more attention to current events in the mainstream media. Then, I started reading about the same current events from the alternative media. Currently, I have already registered to vote. In the future, when the time comes for me to put my patriotism into action, I will do so without hesitation. For patriotism is not in back-biting, arguments, protests, bloodshed or war but in the pen & paper during balloting day. That is where every citizen's true power lies. The highest level of patriotism is displayed when we use our power to choose representatives that will serve the best interests of our country.